Here is the story of the forgotten Kharkov trials, which sought justice for the thousands killed in the Ukraine two years prior to the infamous Nuremberg trial. 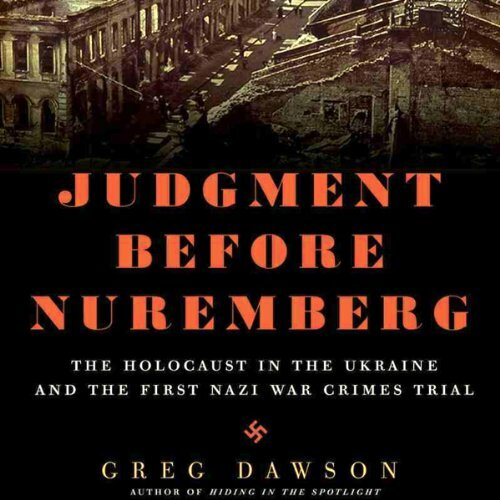 Revealing a lost chapter in Holocaust historiography, Judgment Before Nuremberg tells the story of Dawson's journey to this place, to the scene of the crime, and the discovery of the trial which began the tortuous process of avenging the murder of his grandparents, great-grandparents, and tens of thousands of fellow Ukrainians consumed at the dawn of the Shoah, a moment and crime now largely cloaked in darkness. Eighteen months before the end of World War II - two full years before the opening statement by the prosecution at Nuremberg - three Nazi officers and a Ukrainian collaborator were tried and convicted of war crimes and hung in Kharkov's public square. The trial is symbolic of the larger omission of Ukraine from the popular history of the Holocaust - another deep irony as most of the first of the six million perished in Ukraine long before Hitler and his lieutenants even decided on the formalities of the Final Solution.